A New Honeymoon for the United States and Pakistan? A relationship that has been described as a rollercoaster ride or tagged as a deal between “frenemies” appears to have been rejuvenated with a fresh infusion of bonhomie. Some might describe it similar to the Liz Taylor-Richard Burton marriages: shouting and screaming matches followed by a quiet make-up. Is there another honeymoon in the making now between the United States and Pakistan? After the recently concluded visit of Prime Minister Nawaz Sharif to Washington DC, the atmospherics appear to have changed from a cold balancing act to a slightly warmer embrace. There were the ritualistic rhetorical flourishes aimed at domestic audiences. Sharif decried drone strikes as infringing on Pakistani sovereignty. The Washington Post put paid to that by running a story the day after he left about Pakistan’s complicity in US drone attacks. Noticeably, his government remained mum about that situation. Senior government officials later pointed to the progress made on many fronts, including the revival of the Strategic Dialogue that was last conducted in late 2010 before relations fell into an abyss in 2011 (remember Raymond Davis, who was involved in the killing of two Pakistanis in the streets of Lahore? The raid on Abbottabad to kill Osama bin Laden? The attack on the Pakistani border post of Salala?). Sharif met the entire A-team of the US government. A number of working groups are being revived–most immediately, the energy group that will meet in Washington in early November, followed by a visit of the Pakistani team to Houston. … built on a foundation of mutual interest and respect. …The President and the Prime Minister affirmed U.S.-Pakistan friendship and close cooperation and recalled our positive contributions to international peace and security at crucial junctures during the Cold War and in the post-9/11 period. On-the-ground realities inside Pakistan will not change dramatically in the short run, limiting Sharif’s ability to focus all his attention on mending ties with the United States. Militancy and sectarian and religious violence is on the rise and there does not seem to be a clear plan to counter it in the borderlands with Afghanistan or in the hinterland, especially Sharif’s stronghold of the Punjab. His plans to reboot relations with India, including an important trade deal and granting India Most Favored Nation designation, are on hold until after Indian elections in the spring. Afghanistan will continue to throw curveballs at Pakistan. The economy continues to tank for now. Foreign exchange reserves continue to tumble from a high of $16 billion to around $4 billion and past payments owed to the International Monetary Fund are now coming due at an alarming pace. Sharif has made a good start with the United States. His election was greeted with questions from Americans, but the visit may alter the earlier negative perception for some time. Still, it will take more than words to create a new basis for the US-Pakistan relationship, and the hardest work will need to be done inside Pakistan, by the Pakistanis, for their own sake. The United States can continue to use moral suasion to keep Pakistan on the right path for reform and good governance and keep alive the hope of civilian supremacy, but Sharif must do the heavy lifting himself if this latest honeymoon is to end in a settled relationship and not another splitsville. 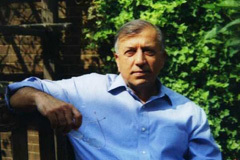 Shuja Nawaz is the director of the South Asia Center at the Atlantic Council in Washington DC.